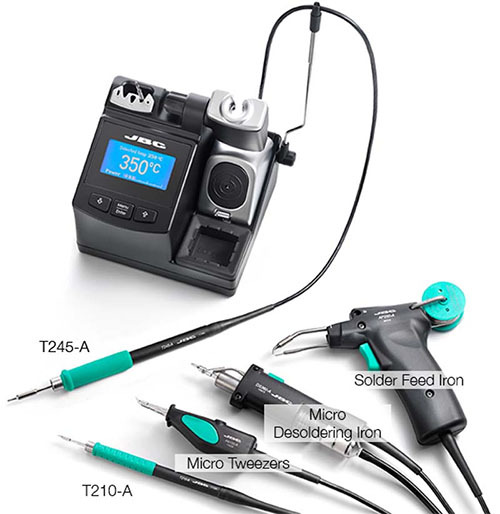 JBC CD-2SHE with T210-A Handle Precision Soldering Station. CD-2SHE used in phone/auto repair industry. works with the JBC exclusive heating system and the intelligent sleep & hibernation features. The CD-B is a soldering station with the JBC Advanced system for general electronic applications.It works with the JBC exclusive heating system and the intelligent sleep & hibernation features.Using the menu you can personalize over 20 parameters to help manage the soldering process.It features a USB connector to update software, create graphs and manage parameters from a PC. Complete cleaning system with an antisplash membrane to keep the work area clean. Use the integrated wiper to remove excess solder from the tip. You can use the USB-B type data cable to connect the computer to observe the temperature curve.